I put it in my car stereo as I left and fell in love. Rarely has an album hit me so hard as this. I played that thing so much, I had to buy her a new copy. I finally got to see them a few years ago. I get to see them again this week in Tucson. I’m starting a campaign this week on Twitter to get Perry to let me backstage. Favorite album and band of all time!!!!! I got to be a pinup model for a day!!!! Everyone knows how much I love the camera, so it’s no surprise that my friend, Laura Reagan, asked me to be a guinea pig for her photography. She’s been taking countless workshops and classes on this style of photography. I was a little afraid. I am not a skinny woman. I have curves. I know others like it, and I’ve finally accepted that this is who I am. …that dog I come home to who’s always excited to see me. …the one howling when I walk down to Will & Jada’s apartment without him. …the dog I yell “Dexter, wanna bone?” to try to get him in the door. Neighbors laugh at that, too. Wanna bone? Get it? …the dog that herds Chank away from me so he can have all my attention. …the dog that, when I take him for a walk, has some swagger like he owns the whole damn neighborhood. He weighs 9 pounds. …the dog that everyone knows in my entire neighborhood. Mostly because he will go up to anyone to give love. …the dog who always sleeps, stretched out, against my back at bedtime. …the dog who follows me into the bathroom and tries to jump into my lap as I pee. …the dog that rides in my bike basket as I cruise around town. 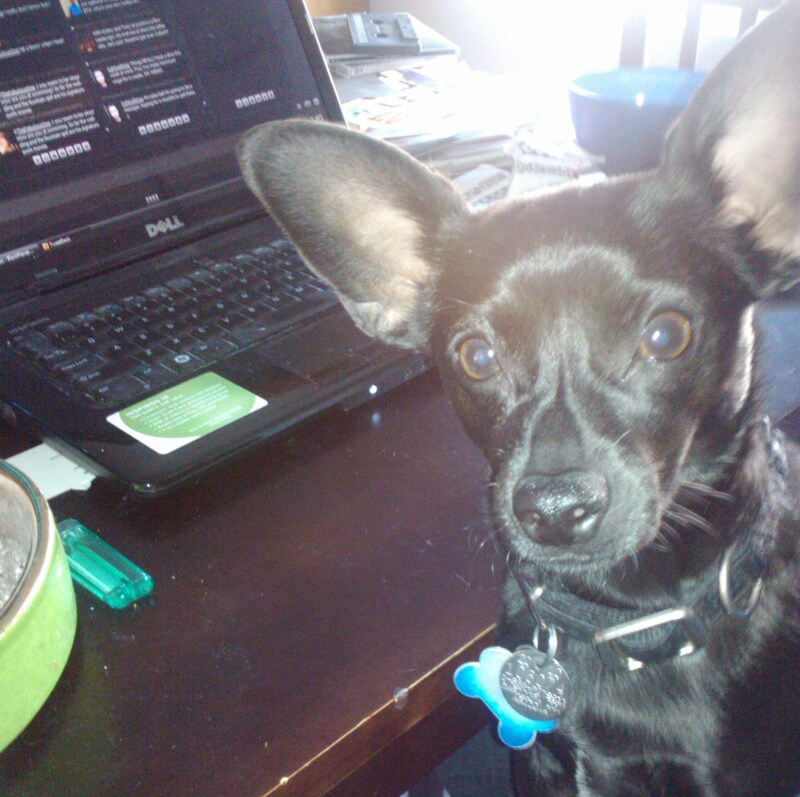 …the dog that is staring at me right now as I type this because he knows it’s about him.